What happened on January 13 in Formula One history? Buenos Aires was again the venue for the first round of the championship, and Alan Jones' win in his Williams Ford set him on his way to that year's drivers' championship. Conditions were harsh, and sections of the track had to be relaid overnight after drivers complained it was falling apart during qualifying; unsurprisingly, the repairs disintegrated from the tenth lap onwards making the surface slippery and 15 cars retired. Nelson Piquet and Keke Rosberg were second and third respectively, both standing on the podium for the first time, while Derek Daley took a career-best fourth. Local delight as Juan Manual Fangio, driving a Maserati, won the season-opener in Argentina on course for his fifth and final world title. Stirling Moss put his Maserati on pole position, but lost ten laps when the throttle linkage broke as he made a juddering start from the grid. Only Fangio and Jean Behra, who came second, finished all 100 laps as Maseratis took the first four places. Peter Collins, who led early on, was forced to retire a quarter of the way through with clutch problems. With the exception of one old Ferrari 500, all cars that took part were either Maserati 250Fs or Lancia Ferrari 801s. 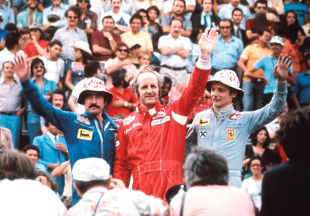 Former world champion Denny Hulme, who had announced his decision to retire at the end of the season a few weeks earlier, won the season-opening Argentina Grand Prix, his last F1 victory. It did not go down well with a huge 120,000 crowd, including President Peron, which for 50 of the 53 laps had cheered local hero Carlos Reutemann before he was forced to retire. Reliability was a major worry as only six of the 26 starters completed the race. Gianni Morbidelli, born on this day in Pesaro, Italy, had a lengthy but unfulfilling Formula One career. In 70 grands prix between 1990 and 1997 he finished in the top six only three times, most memorably at the 1995 Australian Grand Prix when his third place gave Arrows its first top-three finish in seven years. Later he moved to touring cars, where he enjoyed more success. He won the Dubai based Speedcar championship in the 2008-09 season. German driver Helm Glockler, born on this day in Frankfurt, had the briefest flirtation with F1, entering the 1953 German Grand Prix in a Bristol-engined Cooper which suffered engine failure during qualifying. He had a few minor wins in sports car races in the early 1950s.